Listing Case Study: Bidding War! Market Turn Around? Or Good Agent? SOLD! 14 Days, 3 Written Offers, Above List! A Case Study. even after those confusing seller concessions? Is this the tipping point and the start of a major market recover? Or was this an isolated incident involving a great agent and his professional stager? In this blog I will expose exactly how this was done. None of the regurgitated “How to sell your home” articles that Realtors get added to their website as part of their $299/yr internet website package. Some of you will take this information and try to sell your home yourself (which is a pretty hilarious blog in and of itself), and others will use it to kick their Realtor into shape. Not a problem, but the smart ones will just call me (or email). Oh and I guess some Realtors might read this too and use these techniques. I say, no need to compete, just join me, I have to have more up my sleeve than just this, right?). The place was a wreck. Competition! There were 4 other units in the community for sale, some for 100 days. One of the units had the exact same floorplan! Pricing. Picking a price was very tough. There was a ton of data that was all over the place. Believe it or not, I tend to not come to a price until AFTER I’m hired. Why? I don’t do the typical interview of several listing agents, all of which come in with a suggested price. I learned from my mother’s mistakes growing up, she always picked the agent with the highest suggested price, it never worked out well. Now that I’m in the business, I found out that frequently novice agents recommend a high price, just to get the listing, knowing that eventually you will drop your price and they will get paid, oftentimes resulting in you getting several thousand less. Instead I work WITH the client on pricing, and they ultimately decide what to do. Market slowdown AND heading into the winter. This wasn’t easy, we had a race against the clock, the holidays. We could wait until spring, but who knows where prices would fall (or raise) to. I brought in my professionally licensed Stager. (This should be a separate blog) She was amazing. 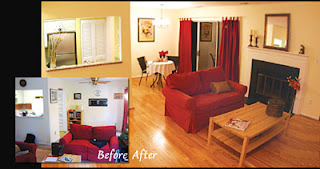 Not only did she stage the place to look like a model new home, she guided a team of workers to renovate the place. New hardwood floors to have that unique pop unlike the competition, granite countertops , (the premium stuff, not the cheap stuff that the other unit had) new appliances, new carpet in the bedroom. All for about $10,000. Pricing. We came up with $280,000. I actually INCREASED the price by $5k at the last moment. It just looked soooo good. I had spreadsheets that showed ratios comparing recently sold units to what they sold for 3 years ago (when my client bought mine) and looked at the current actives. This wasn’t a case of “Oh he just listed it low to sell fast.” Actually I was scared that the house would NOT appraise, as in too high! 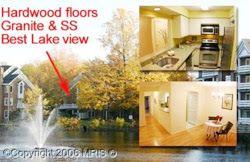 Did you know that it costs a Realtor $12 to post 20 photos? Yet maybe 20% of Realtors do so. And as a buyer, you know you love looking at everything! The good, the bad, everything. The more you see the more compelled you will be to see it person. Versus what? Make the place a mystery and compel people to come for a visit? Wishful thinking. Also the main photo was a collage. I did this because a) it tells people that this link will have more photos b) some home search websites only show the first image. Domain name with more photos: I bought a www.555streetname.com and linked it to a photo album with even more photos. Check out the photos here. Typical Washington Post ads (small, bigger isnt’ better) and Craigslist ads. No rocket science here. very visitor to get their feedback. I do this online by tracking the lockbox reports. I email them to get feedback so my client has in writing the agent’s thoughts. Usually this is not a negotiation, just honest feedback on what they liked and disliked. The market was slow, maybe only 5 real buyers saw it and 5 lookers. The feedback was amazing, but it still wasn’t selling. A few people expressed a strong interest but nobody was willing to make the first leap to write. In this marketplace, there ARE buyers, but they are scared and kick the tires longer. “Let me know if you get an offer”, is what I kept on hearing. They all loved it, but nobody was taking the final step to make an offer. Finally I get one offer. After letting everyone know that everybody else loved the place and that everyone was “about” to write (which was true, I don’t lie or fib on this stuff), one person finally wrote. This is what any good agent should do when they get an offer. They let EVERY remotely interested party know that an offer has hit? Is that ethical? Um, why not, I represent the seller and my job is to fight to get him that last $5k- $15k, and this is one way to do it. Would an agent that gives you a low commission rate do this? What to make an extra $50? Maybe, if so… hire him! This step can almost double the work for the agent, and for only a couple hundred dollars more in commission it isn’t worth it for most. I do it to a) help make you that last $10k and b) hope that you will tell your friends about it. Bidding war after 14 days! In the olden days, a bidding war only occurs within the first week. Here we were on day 14 with a bidding war in a dead market. I don’t think the agents even believed me. SOLD! 14 Days, 3 Written Offers, Above List! Ultimately I was able to get the sellers $15,000 over one of the offers and a net that was a few thousand above the already stretched ($5,000 was added at the last second) sales price and a 2nd offer that escalated over list (I’m talking net sales price, even after the seller subsidy). While I’d like to go into the details on their purchase, that stuff wold reveal secrets that I don’t want the other side to know about. It took a few weeks to negotiate and that was also a tough one, but they got an amazing price $45k below list (which shouldn’t be a metric since I’d rather you get a place for full list price on an aggressively priced house than save $50k on a place overpriced by $100k). 703.827.4OO6 Like this? Sign up for more! I'm "UPSIDE-DOWN," What Should I Do? Lose $25k? 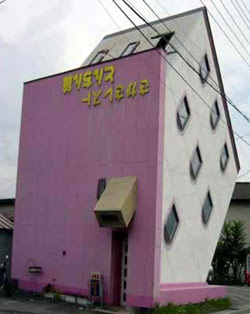 Being “Upside-Down” in a loan is a phrase most commonly used with car loans. It means that you owe more than the car can be sold for. With cars, if you are in this situation, you have to actually bring cash to the table to sell your car. So if you have an outstanding loan of $20,000 on the car that you bought for $25,000, and you can only sell it for $15,000, you have to come up with $5k to sell the car. You take the $5k hit now, but save on years of monthly car loans that will far exceed $5k. Regrettably this starting to happen on a somewhat frequent basis with homes. This did occur in the mid 90’s but was unheard of again up until a year ago. So a home owner buys a place a year ago for $300,000. Lets say he puts 5% down or $15,000 and the loan is for the remaining $285,000. He buys it as a long term investment, but something went wrong: job relocation, divorce, scary neighbors, whatever. He wants to get rid of it and he is faced with a house that can only clear $275,000 due in part because of the market drop and after darn Realtor fees. Most people will go with option #2. There is something about human nature that makes us feel more pain losing $1,000 than the joy of making say $10,000, which we rationalize as deserving. People would rather fight the smallest loss today, even if that means running it all the way down to bankruptcy. I’ll focus on Option 2 because that is what most people do, but most haven’t evaluated all the pros and cons of that decision. First of all, you have to realize that you are now in Vegas, and you are essentially doubling down your bet. You aren’t evaluating the current situation (“cutting your losses and running”) and instead you are gambling that the future will be better… eventually. If you are betting on Red in Vegas, just double down! Eventually you will break even right? Even if you are in for $50,000, Red has to hit soon right? Come on Red!!! While your Red might hit eventually with real estate, you have to be prepared for the worst. Hopefully the market will bounce back and you can then take a lower loss or seek the holy grail… breaking even. Great, yes the Spring is usually better, but usually during an up market. Last year the winter was horrible and the spring just extended that downward. All the houses that sat in the winter were still there, and for a lower price once spring came. The newly listed houses then had to start with a lower benchmark. So waiting might cause your house to go down another $10k-15k. 2. I’ll just rent it! Easy as that! Ok, but have you run the numbers? Oftentimes you will have as much as a $400 per month discrepancy between your mortgage and your rent. That makes for about $5,000 a year. After 3 years you are $15,000 behind. If the market rebounds great, but if it stays flat, you are now $15k deeper in debt. What if it takes 10 years to recover? It happened in 1990. Also you can’t just count the sales price, you have to consider all the expenses along the way. Oh and ask your accountant, but the tax advantages that you had while owning the place you lived in are gone. Also I almost forgot, what about that 5 year ARM that is coming due and you haven’t sold it yet and your mortgage goes up 30%? 3. I’ll live in it. Ok, but I thought you wanted to get out of the place? Your time horizon better be long enough to ride out the storm. If this is just a 1 year bandaid, you might be even worse off in a year (nobody knows, except the National Assoc of Realtors, NAR, of course!). Also if you have a mortgage of $2,000 and you have the option of renting out a smaller place for $1,000, you have to calculate the $12,000 savings a year (but don’t forget your calculate back in your tax advantages). For some of you, the numbers might leave you no real choice. If you can’t come up with $15,000 to sell it now, you just can’t do it. But for the rest of you, that are electing not to do it because you feel the pain of a $5k loss (or even $50k) is just too much, just be prepared for a worst case scenario in 1 year or 3 or 10 when you wish that you were only $5k behind. In my blog on Leverage, The Untold Risks With Buying. There is an example of a lady that lost $150,000 over 250 days, I bet she wishes she cut her losses earlier. She couldn’t believe it could go down that much. This is DC!! My intention is not to scare or depress anybody. I just want to make sure that you have fully thought out what your options are. 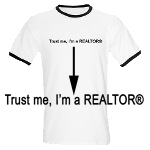 I can’t tell you where the market is going (see blog on Realtor’s aren’t stock brokers), but you have to be prepared for all scenarios. I know you will hit yourself if you take a loss and the market recovers, but what would you feel if it didn’t and you had to file bankruptcy? Most Realtors won’t go over the doomsday scenario of above, but it is real. Our job is to make sure you look at all your options and only you can decide what to ultimately do. If you sense a bit of bias in here, that was fake. I just put that in there to counter balance your preexisting biases.